“Producing more food with less water and energy” was the topic covered by the well-attended thematic session, held as part of the 2nd IFAD Global Staff Meeting in Rome on 22 February 2016. Organized by the Near East, North Africa and Europe Division in collaboration with the Policy and Technical Advisory Division, the thematic session explored the relationships and trade-offs within the water, energy and food security (WEF) nexus. Why is the WEF nexus so important? Globally, the agrifood sector uses about 80 per cent of the world's freshwater resources, and accounts for some 30 per cent of total energy consumption. In the coming 30 years, global food production is expected to rise by 60 per cent, accompanied by the respective increases in the use of water for irrigation by 10 per cent and in energy consumption by an astounding 80 per cent . These statistics are of the utmost relevance to the Near East and North Africa (NENA) region, as this is the most water scarce region in the world. The region is heavily populated (with some 170 million rural people out of a total of 390 million people in 2015), and, with the highest population growth in the world (of an estimated 250 million by 2050, including 40 million rural people ), will experience great increases in demand for water, food and energy. By 2050, the per capita share of water as well as crop production in NENA are expected to decrease by 50 per cent, compounded by a rising cost of energy. These trends will affect some 34 per cent of rural people currently making their living from agriculture and livestock. Considering the growing challenges in the region, there is an urgent need for innovations to optimize the use of water and energy, and to secure food production. How can we produce more food —using less water and less energy? In looking at IFAD's work in the NENA region, the discussion focused on what has proved to work on the ground so far, in terms of boosting agricultural production and productivity while sustainably managing the region's limited natural resources. From renewable energies (e.g. 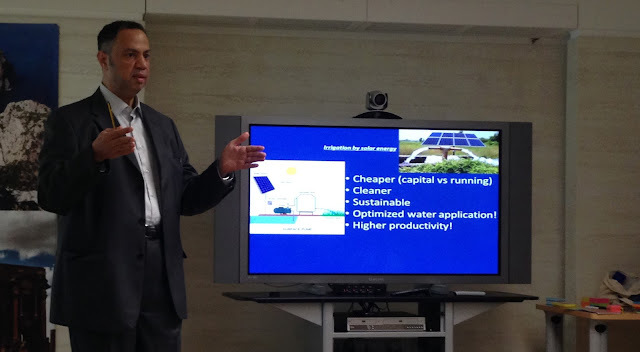 solar irrigation pumps with a higher initial investment cost but lower running costs) to non-conventional water resources (grey water treatment, integrated aquaculture systems, hydroponic systems, etc.) to the promotion of smart agriculture and a value chain approach, a vast array of strategies are available to foster agricultural and rural development, starting with a focus on increasing productivity while lowering energy and water use. How can we put the nexus approach into practice? The session explored additional factors to be considered in a nexus approach. Issues like soil quality, which add further complexity to the model, simply cannot be overlooked. This is something we have observed in Azerbaijan, Armenia and Egypt, where salinity increases due to aridity on the one hand and drainage problems on the other, making it difficult to grow any crops. Increased income is a key motivation for smallholder farmers to adopt an innovation. For this purpose, it is key for the nexus approach to include an identification of market opportunities. From a project perspective, this translates into the need to improve the economic and financial analysis, in order to be able to clearly demonstrate resource savings and increased benefits both at household level and overall project level. However, poor smallholder farmers are risk averse and resist devoting their farming exclusively to cash crops, as such a specialization reduces their resilience to shocks. Hence, the governance dimension, accompanying the innovations to be implemented, becomes essential in providing an enabling framework and institutional environment for smallholder farmers. Capacity building is also required to make new farming technologies adoptable. The session concluded by recognizing the importance of the WEF nexus approach and by highlighting the next step towards putting it into practice: the need to engage effectively with a wider range of stakeholders than the present practice. Mainstreaming the WEF nexus approach will require additional efforts to negotiate trade-offs and bring together differing stakeholder incentives, thereby developing tailored local solutions that address the daily challenges of smallholder farmers.